Limited only by your imagination. 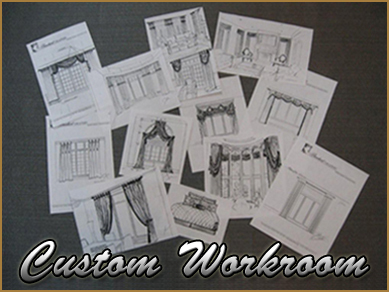 We can design & produce fine custom drapery from period traditional to the latest in contemporary modern design. Many of our own unique designs are created in house for our clients. Naturally our workroom also produces custom bed coverings & decorative accent pillows, quilted bed spreads, duvet covers, upholstered head boards & more. Select from thousands of beautiful fabrics & trimmings. View a wide range of decorative drapery hardware in every style. We are a Hunter Douglas Showcase dealer. Including the exclusive Alustra line of window coverings, all of which can stand alone or co-ordinate beautifully with custom drapery treatments. Visit our Studio Showroom for ideas or call for an In Home Consultation.